Android One has not been a great hit, but Google managed to attract a lot of users to the Android One devices with just two things- low cost and up to date OS. Everytime Google will bring an update to the Andoid OS, Android One users are the one after Nexus users who will get the OTA update very fast. Now, Google released the Android 6.0 Marshamallow a few days ago with the new Nexus line up and we have already got a list of phone from different OEMs that well get the Android Marshamallow update. We also spotted the Karboon Sparkle V getting the Android Marshamallow update. Today, I just spotted the Micromax Canvas A1 getting the update, though the update package size is great than tha we had seen on Sparkle V. Still, many users are complaining that they are not getting the Marshmallow update when they checked via their phones. So, here’s a good news for them. All the Android One 1st Gen phones in India have already got the Android Marshmallow update packages, and Android One phones in Bangladesh, Sri Lanka, Myanmar, Nepal, Philippines, Indonesia have also got the update packages ready to get delivered. 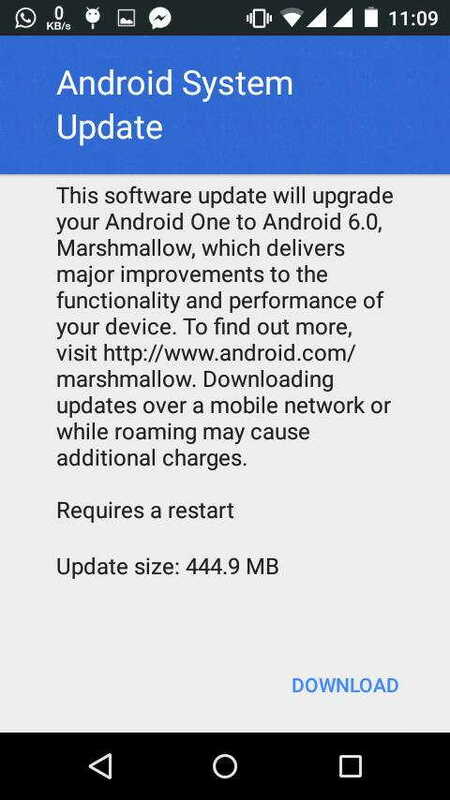 So, if you’re waiting for updating to Marshmallow for long and haven’t got a notification on your phone for the update you can just download the package and install manually. But yes, remember one thing- To update manually you must have Lollipop build (LMY48M) without any modification and also, you must have bootloader unlocked on your device. So, if your device meets these requirements you’re ready to install Android Marshmallow. Below are the links from where you can download the update packages for your Android One phone. So, just download them and install the Android Marshmallow manually on your Android One device. Hope, you will be able to update fast with this method and won’t have to wait for OTA update. Meanwhile you can check out Lava Pixel V1, the 2nd Gen Android One smartphone.